Running the bases isn’t all that easy. Man, remember when David Ortiz could play the field?? LOL Poor Jesse Chavez. Its funny watching AL pitchers run because you can tell they never ever run. His stride was ugly and clumsy as we all saw. In the last one, why the hell is the guy tagging from first anyways? 2:34 Hicks ran from a different time zone to tag him out! When you get in a rundown run! The defense can always botch it. 3:52 That was just perfect execution on that triple play. For the third out, the infielders followed the book, even though it was an unusual play, a rare play, and one that requires different tactics. Normally, when someone stops between bases, you run directly towards the runner, and then if he breaks towards either base, you can throw to the base he's heading towards. Adrian Beltre is the runner who was standing between third and home. With Prince Fielder still standing on third, the correct play is to throw to second from where he stood, even though it looked weird seeing the ball sail in the air for so long. And, as the announcer said, the shortstop, Tyler Saladino, simply has to run Beltre towards third, and either he's out if Fielder stays where he is, or there's an easy out with little risk of a run scoring if Fielder runs. This compilation made me a bit sad! 3:43 I cannot for the life of me figure out why Carrera fell down. No one pushed him, and it didn't look like he was trying to walk away or anything; the umpire was explaining to all of them that Pillar (the other baserunner) was out, since the trailing runner is automatically out when two men put their foot on a base (no tag required), so Carrera wouldn't have been leaving anyway. The only thing I can think of is he jumped a bit when Rivera (the third base coach) touched his back. This is PRO ball. Can you imagine how much yelling would be going on in High School and College ball ? This falls under the " I just work here " categorie". I could've sworn the guy Chavez at 1:20 did not look like a Major Leaguer and seemed like he was running bases for the first time in his career. Then I assumed this must've been interleague and he was a pitcher. Yep… no way that guy is a hitter/runner, lol. 0:50– ain't that a home run? you just had to add the crap music at the end eh? Because that makes sense in a baseball video. A pitcher tripping over the bag ain't exactly the same thing as a brain-cramp. 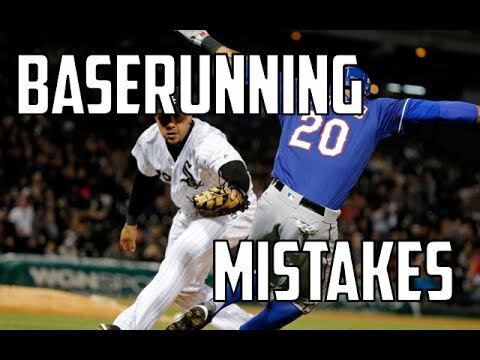 I saw this vid and figured it would just be a bunch of baserunning errors made by Robbie Cano. you should do best plays by every MLB team for your next video! I never made it past Div III (made the team but didn't play freshman year and gave up) but how do players not know lead runner has the base until he reaches the next base or is out. I'm amazed at how often the lead runners leave a double occupied base to result in a double play.